The evolution of Goofy as a lead character has been one of the most fun things to watch as I’ve been going through these shorts. 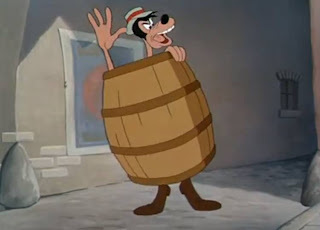 When you see the Dippy Dawg version of the Goof early on in his career, during the Mickey Mouse barnyard sequences, it’s hard to foretell the George Geef version that we see during the 1950s. 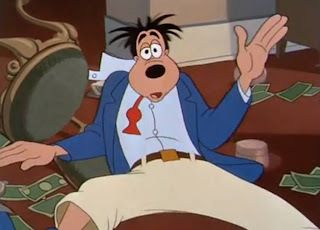 Becoming the every man, though, was a crucial element of Goofy’s evolution. In Get Rich Quick, he’s experiencing something that we all have from time to time – the temptation to find an easy way to make money. In the 1950s, getting rich quick didn’t mean creating a .com that you ended up selling for lots of money. No, Goofy instead goes after wealth the only way he knows how – gambling. 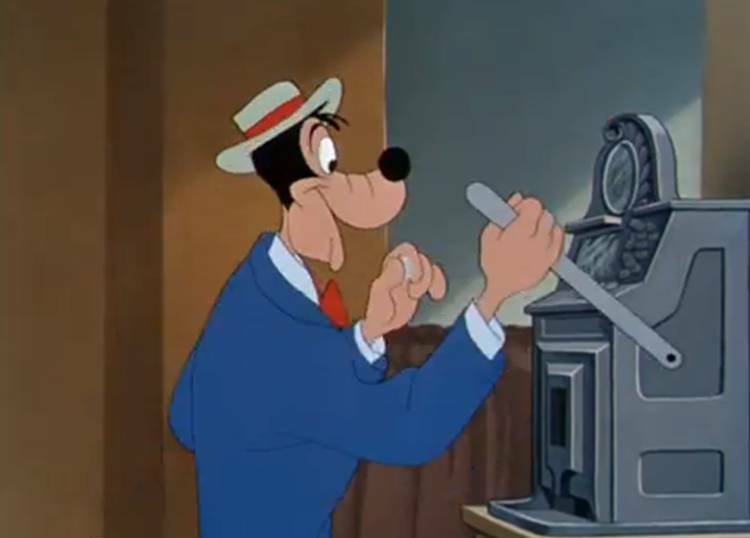 The whole short is about how Goofy finds any way possible to gamble, no matter how big or how small. It lends itself to some very inventive and cool gags, such as when Goofy emerges from an alley way dice game in a barrel, making you think he’s lost everything. Instead, it turns out he needed the barrel to carry all the cash he won! The entire short contains gags that we have not seen in many years from the shorts. 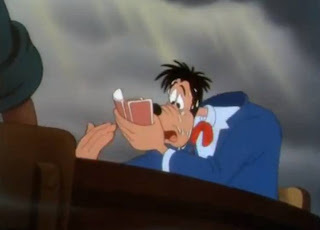 Another example is the way that Goofy enters a poker game. With all his cohorts gathered around a table, there’s a wall of cigar smoke floating up from the table. Goofy manages to enter the fray by opening the smoke like a gate, then closing it behind him. That sort of gag has been exceedingly rare ever since the early days of the Mickey shorts, but it shows what Disney’s crew could do when allowed to let their imaginations run a bit. The final coup de grace, though, comes when Goofy gets home, and is confronted by his wife. She is outraged to find him gambling, at least until he says that they can use all the money he won, which is promptly claimed by the wife. The quick turnaround from yelling at the Goof to figuring out how she will spend the money is a stereotype, but a funny one. It’s a great short from start to finish that really allows Goofy to inhabit the every man role and let the animators use some great visual gags to tell a great story. In short? It’s Disney.